I first had creamy grits at one of my favorite Vegas restaurants Lola’s I had shrimp and grits it was amazing and from that moment on I was a creamy polenta convert! If you noticed I just used the words grits and polenta interchangeably. So what is the difference anyhow? Here is what I found out. They are basically the same thing, dried corn kernels ground to the desired consistency. However, the main difference between the two is that grits typically start off as hominy before they reach the mill. Hominy is dried corn kernels treated with alkali usually limewater this helps to increase flavor and aroma– a process called nixtamalization. Either way, grits and polenta are cooked pretty much the same way and from what I can tell taste pretty much the same too. 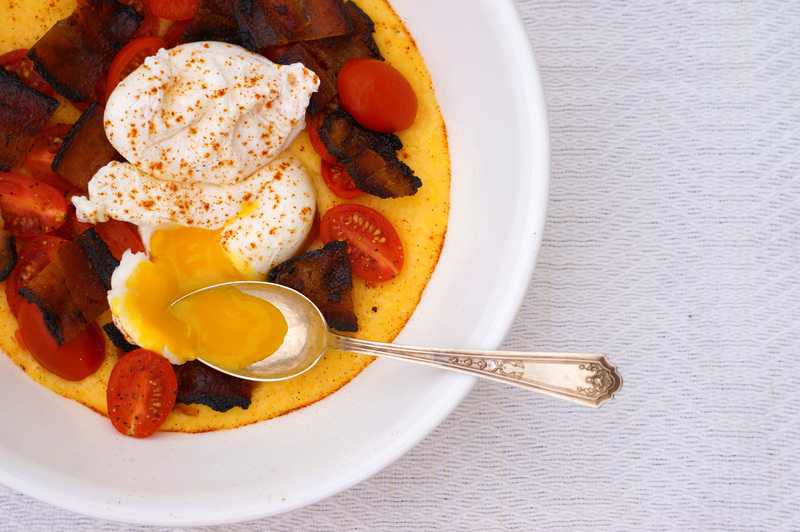 One of my favorite ways to make and eat polenta is in this creamy and savory breakfast bowl! It’s the same creamy polenta I would serve with spicy shrimp but breakfast style. That means crispy bacon, soft boiled eggs and a few tomatoes thrown in as well! 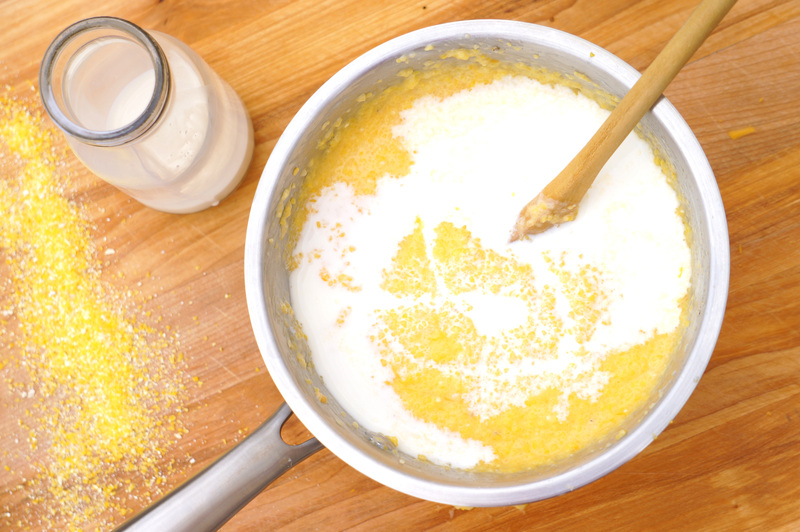 Start by making your creamy polenta. In a medium pot place the corn grits, water, salt and bacon grease on medium high heat. Allow this to come to a simmer until all the liquid has been absorbed, stirring occasionally. 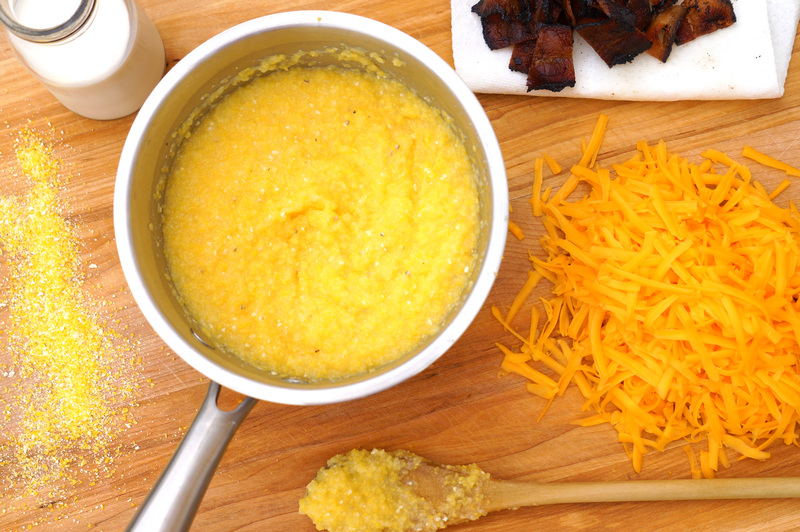 The bacon grease is optional but it does add an amazing flavor to the polenta so I say do it 😉 Just reserve the grease from cooking your bacon. When all the liquid is absorbed add the cheese and half and half stir this in. Now let’s talk poached eggs. If you have never poached eggs before don’t worry it’s pretty easy. Bring the water, vinegar and salt to a low simmer. You won’t taste the vinegar but it really helps to bring the eggs together and the salt adds lots of flavor. Crack the eggs over the water two at a time and let them cook for 3 to 4 minutes. 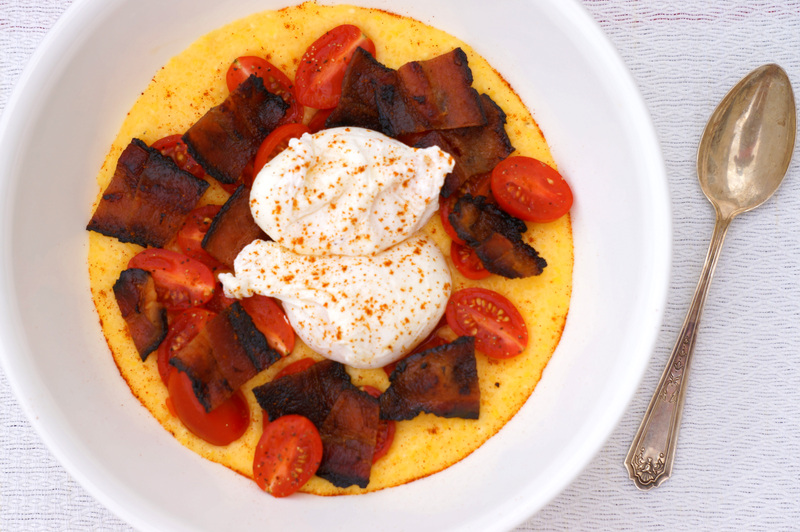 To finish place two generous scoops of polenta in a bowl top with the bacon, tomatoes and poached eggs sprinkle a little cayenne pepper over the top and enjoy! Next: Next post: You Only Get One First Birthday!